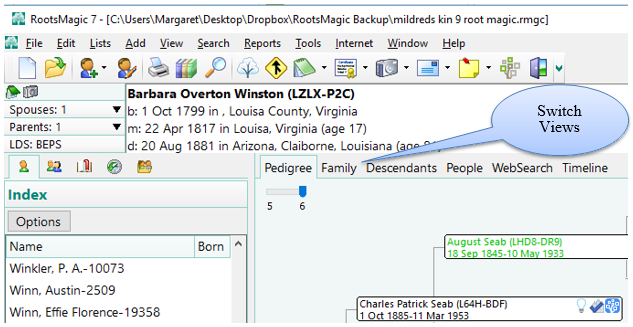 Recently I asked Dr. Ezell to answer a few questions about her favorite genealogy software program, Rootsmagic. 1. 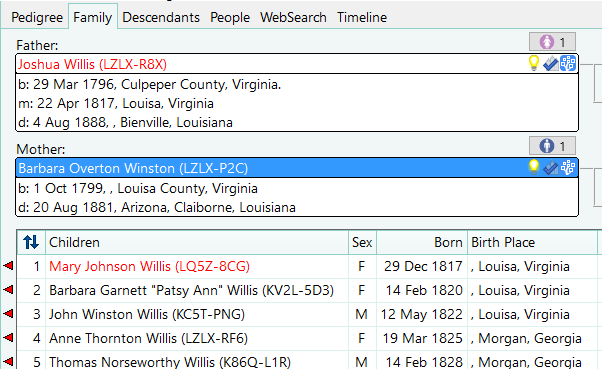 Why should a genealogist use a genealogy software program? Good software programs like RootsMagic make it easy to share information. Some also have iPad, or Smartphone versions. The mistakes in my database are my own, and all changes are mine. I decide when something is proven, when I have enough sources, and who is related to whom. There are two types of genealogy/family history programs, those that run in the cloud and those that run on your home computer. Example programs on the Cloud are Ancestry, FindMyPast, and MyHeritage. They are easy to share with others. Example software program that run on your computer (PC or MAC) are RootsMagic, Legacy, Family Tree Heritage, Family Tree. 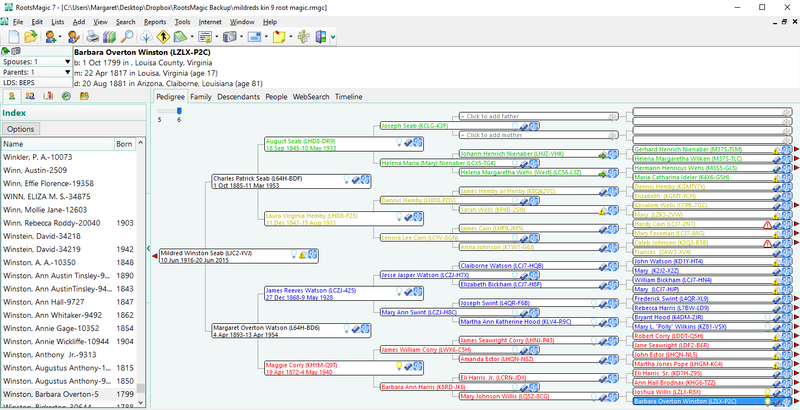 When I use collaborative online family trees, such as Family Search, other users can change the entries. Example: My great grandfather’s name was James Reeves Watson, the Clerk of Court in Claiborne Parish, LA. Every document we have has his full name. One of my unknown relatives decided to wipe out his full name and put in just JR Watson. I had to go back into FamilySearch and put in his full name, documented. He could have had a nickname of JR, but my mother at 99 had never heard her grandfather called that. She had been very close to him. The same thing happens when you use any of the online program and you don’t make your file PRIVATE! But you don’t want to make it private so you can find new relatives and researchers. That is the oxymoron for researchers! So have your own copy offline! 2. What genealogy software programs have you used? PAF (Personal Ancestral File), which is no longer supported by FamilySearch as of JULY 15, 2013. 3. Why do you recommend using RootsMagic? 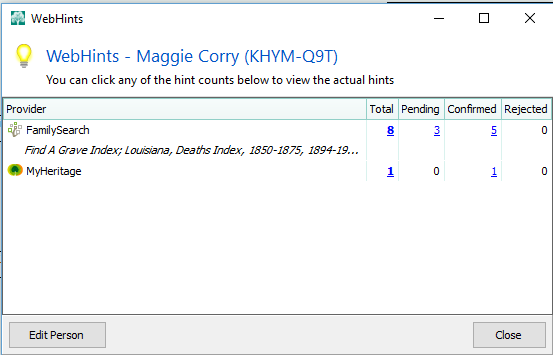 It works/synchs/searches/imports directly with FamilySearch and soon it will with Ancestry. Later this year, RootsMagic users will have access to Ancestry’s huge collections of records and members’ trees. With this new association, comes the ability to use the hints (Shaky Leaves). This will be in addition to the Hints from FamilySearch and MyHeritage. 4. Is there a great feature of RootsMagic that people should be using and don’t? Color Coding people and lines. You can use the color coding to highlight those who want work on or highlight you problem people for whom you need more documentation. Switching Views from Pedigree to Family to Descendants to People, WebSearch, Timeline. 5. How can participating in a user group help a genealogist? You can ask your specific questions or ask for a demonstration from other members. A current example topic is: Help for moving data from Family Tree Maker to RootsMagic. Each month our RootsMagic User Group tries to have a lesson of some type. Researchers new to RootsMagic 7 may have challenges learning how to enter source citations into RootsMagic, so I thought I would show how I enter a new source and then create a citation, with the Evidence Explained source templates, and with a free-form template (in a later post in this series).This past month we were going through lesson on Creating Source Citations in Rootsmagic 7 from Randy Seaver’s Blog at Genea-Musings. You can view these blog posts here. The Metro DC RootsMagic User Group meets at Washington DC Family History the 2nd Saturday of each month at 9:30 a.m. except when major Genealogy Conference are the same weekend. Everyone is invited to attend. After the RootsMagic / Ancestry announcement there have been a lot of new users, so we have gone back to a lot of the basics at the meetings. We have a free-for-all question session after the lesson. Having stood with her Mother for 3 days at the copier straight at the University of North Carolina Chapel Hill Wilson Library Manuscript Room, she is now glad to have so many digitized online records. Her computer skills were used to train her Mom to use the computer at 70 years of age. She wrote more than 15 genealogy books that Margaret edited, formatted and prepared the text and photos for camera-ready copy for publishing. The books are all on her family – mainly southern roots – Corry, Brodnax, Watson, Cain, Seab, Swint. She and her Mom submitted over seven (7) thousand records to the FamilySearch.